There's a whole world out there. And with the Honda Crosstourer you can explore it in comfort and style. 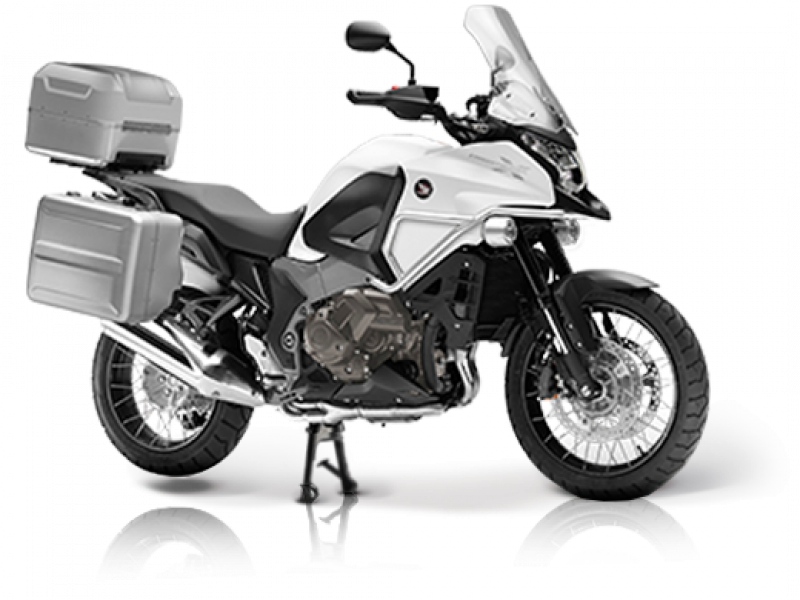 It takes the best elements of an on-road motorcycle, such as performance, handling, braking and stability and combines them with the suspension systems and riding position of an off-road motorcycle. Plus, with a range of new features for 2014, even the longest of journeys will feel effortless. The Crosstourer is all about getting the details just right. The spoked wheels add style, but also absorb shocks from rough road surfaces. The advanced suspension system with rigid 43mm upside down telescopic fork offers control, precise steering and stability. Power is provided by the 1,237cc V4 engine, which has been optimised for strong torque from low and medium rpm. The machine also comes equipped with selectable Torque Control System (TCS) which increases the reassurance the rider has on low-friction riding surfaces by ensuring the engine never transmits more power than the rear can handle. 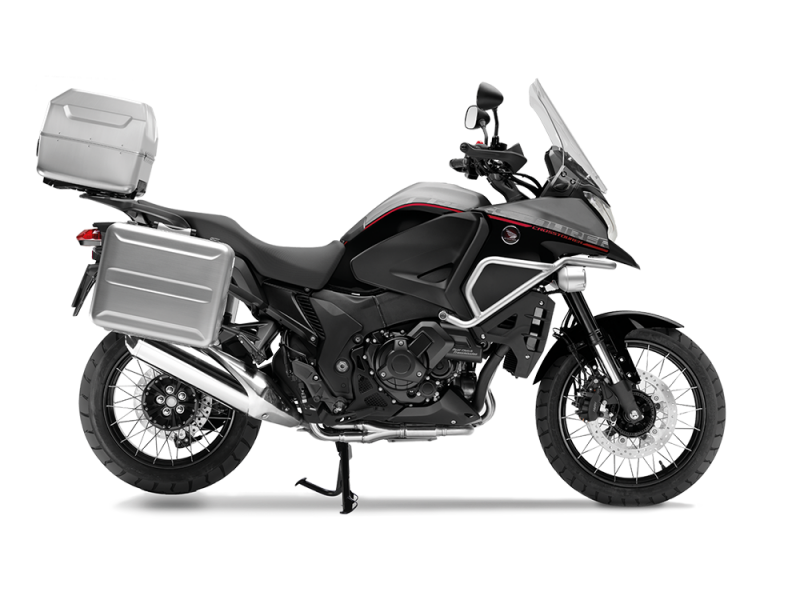 The Crosstourer's rugged body is designed for long journeys, with channels in the fairing that reduce the frontal area while ducting cool air into the radiators. The headlights and effective windscreen are also positioned further towards the middle of the machine to help centralise mass and offer greater wind protection. A 'Wave' key design offers improved security thanks to the internal grooving and greater strength, while the new self-cancelling indicators provide an extra level of convenience. A revised seat makes it easier to plant your feet on the ground and a new low seat accessory takes an extra 20mm off the seat height. 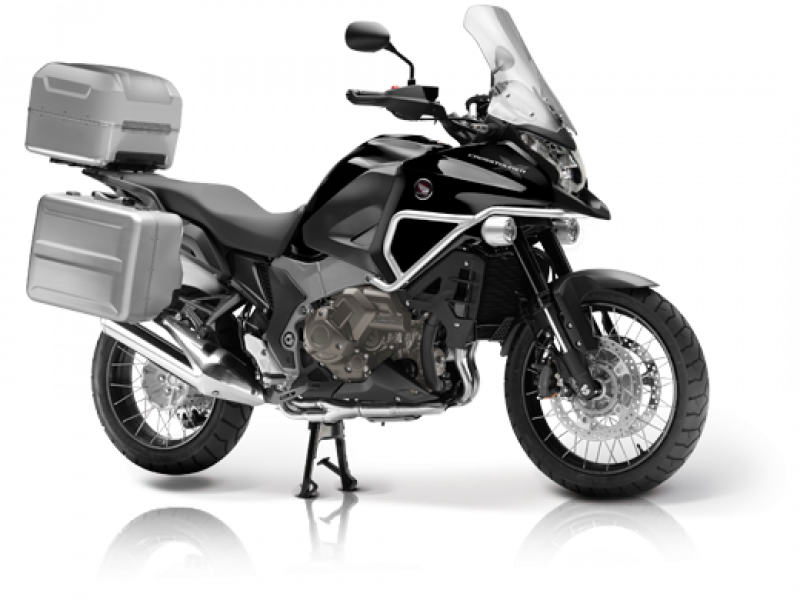 New colours for 2014 complete the refinements, all of which are designed to make the Crosstourer the ultimate go-anywhere, do-anything adventure sports touring machine. The Crosstourer is also available in Dual Clutch Transmission (DCT). Honda's DCT system is a perfect fit with the Crosstourer's advanced, pioneering spirit. The twin-clutch transmission offers both manual gear shifting, using buttons on the handlebars, and stress-free fully automatic functionality which can be manually overridden whenever the rider chooses. New for 2016, two tone red and black colour scheme with adjustable windscreen. 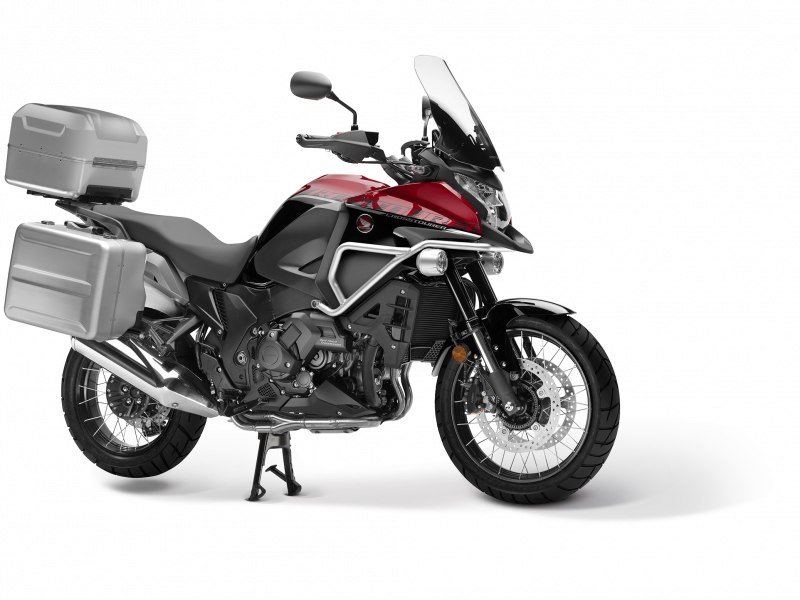 VPL Terms and Conditions: New retail VFR1200XA CROSSTOURER orders from 01 July 2018 to 30 September 2018 and registered by 30 September 2018. Subject to model and colour availability. Representative Example based on 3 years 6.9% VPL; Offers applicable at participating dealers and are at the promoter's absolute discretion (excluding Channel Islands). Indemnities may be required in certain circumstances. Finance is only available to persons aged 18 or over, subject to status. All figures are correct at time of publication but may be subject to change. Honda Franchise Dealers are credit brokers, not lenders. Credit provided by Honda Finance Europe Plc. Cain Road, Bracknell, Berkshire RG12 1HL. Honda Financial Services is a trading name of Honda Finance Europe Plc. a company registered at Companies House No 03289418. Honda Finance Europe Plc. is authorised and regulated by the Financial Conduct Authority, Financial Services Register number 312541. 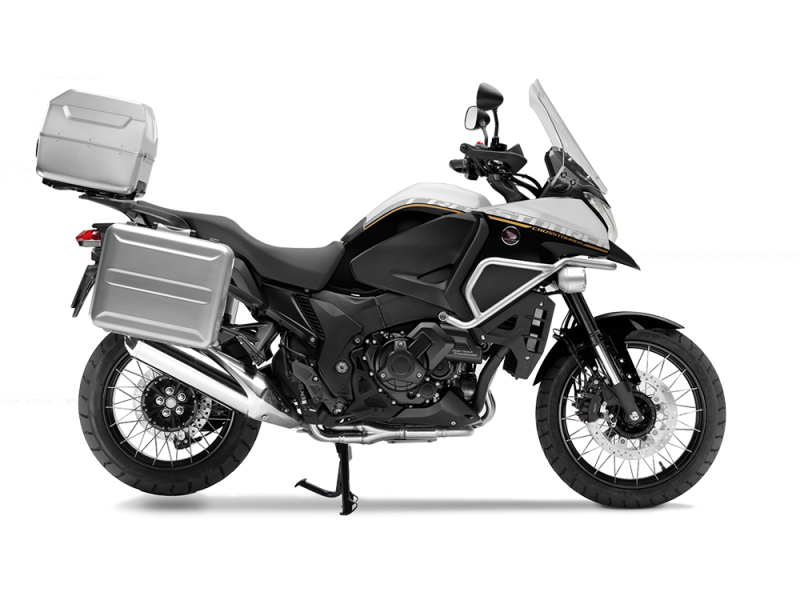 PCP Terms and Conditions: New retail VFR1200XA CROSSTOURER orders from 01 July 2018 to 31 August 2018 and registered by 31 August 2018 Subject to model and colour availability. Offers applicable at participating dealers and are at the promoter's absolute discretion (excluding Channel Islands). Representative example based on 2 years 0% PCP. Excess mileage rate applies. You do not have to pay the Final Payment if you return the bike at the end of the agreement and you have paid all other amounts due, the bike is in good condition and has been serviced in accordance with the Honda service book and the maximum annual mileage of 4,000 has not been exceeded. Excess mileage rate applies should this be exceeded. Indemnities may be required in certain circumstances. Finance is only available to persons aged 18 or over, subject to status. All figures are correct at time of publication but may be subject to change. Honda Franchise Dealers are credit brokers, not lenders. Credit provided by Honda Finance Europe Plc. Cain Road, Bracknell, Berkshire RG12 1HL. Honda Financial Services is a trading name of Honda Finance Europe Plc. a company registered at Companies House No 03289418. Honda Finance Europe plc is authorised and regulated by the Financial Conduct Authority, Financial Services Register number 312541.